The tiny town of Columbus (population 999) is for perfect basecamp for horse and wine country in the foothills. In the historic downtown, see one of the oldest courthouses in North Carolina and grab lunch or dinner at a number of restaurants. 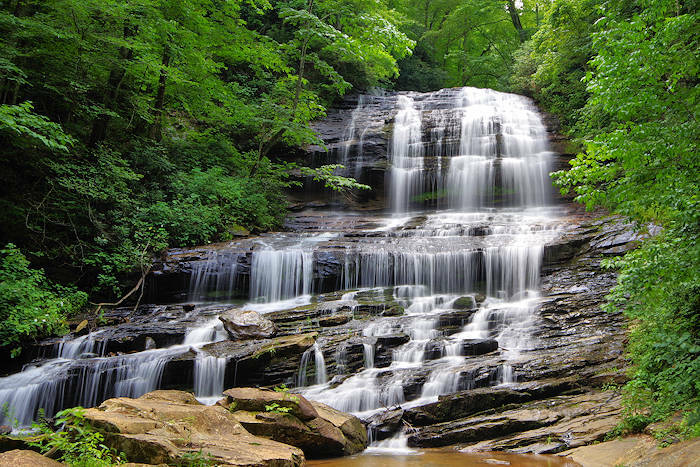 It's an easy 42-mile drive from Asheville via I-26 East. It's just 4.5 miles east of Tryon and about 12 miles south of Lake Lure. 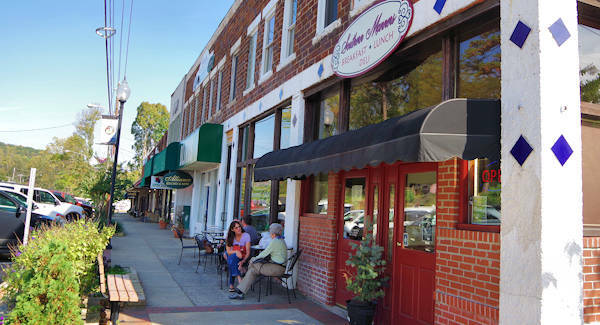 The four-block downtown area has some great local restaurants and some shops for browsing. Go to Winding Creek Brewing (322 East Mills Street) for local brews in their taproom and enjoy a variety of artists in the Music Hall. Stop by the First Peak Visitor Center at 20 East Mills Street for plenty of local information. 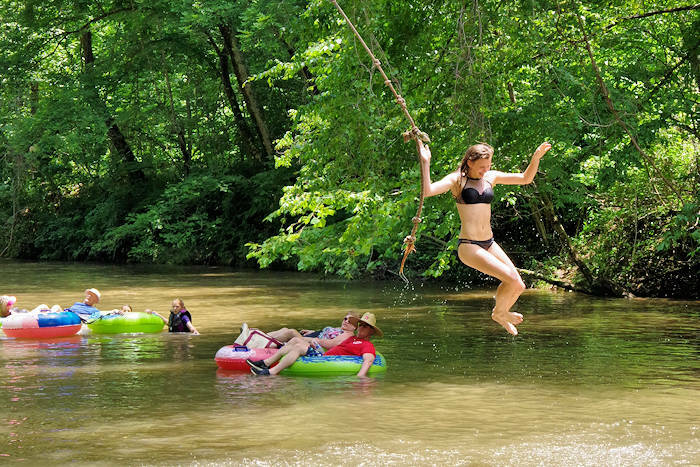 Enjoy two parks in the middle of tiny Columbus! Stearns Park with its lovely gazebo hosts many events. It's a great place to picnic while enjoying the mountain views. Behind the courthouse is Veterans Park with a fountain and memorial. Columbus Farmers' Market is open on Saturday mornings 8 AM-12 Noon year-round: From April through mid November, visit vendors outdoors on Courthouse Square with local, homegrown food and handcrafted art. During the winter, the market heads indoors to the basement of the Columbus United Methodist Church (76 North Peak Street). 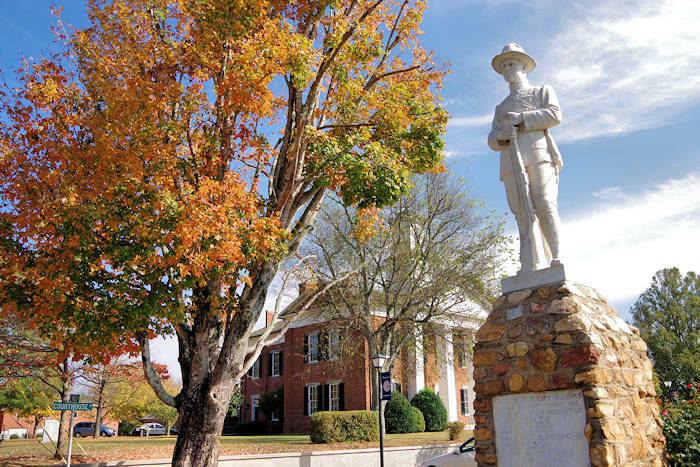 The Doughboy Statue (photo at top of page) was built in 1920 to honor the men from Polk County who fought and died in WWI. 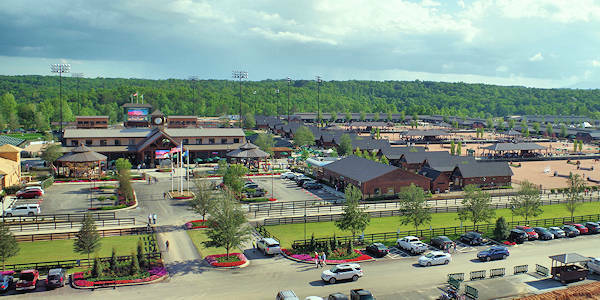 Just eight miles east of downtown Columbus is the new Tryon International Equestrian Center with international horse jumping competitions, restaurants, shops and many free events. Read more. In September 2018, they will host the FEI World Equestrian Games. 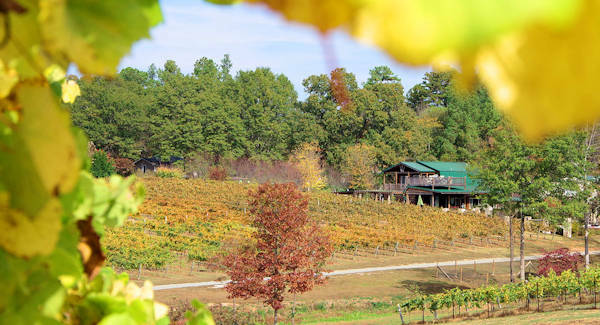 Since this area is located in the "Thermal Belt" with mild temperatures and climate perfect for grapes, visit several wineries in the Tryon Foothills Wine Country. Read more! White Oak Mountain Road is one of our favorite scenic drives in the North Carolina mountains. 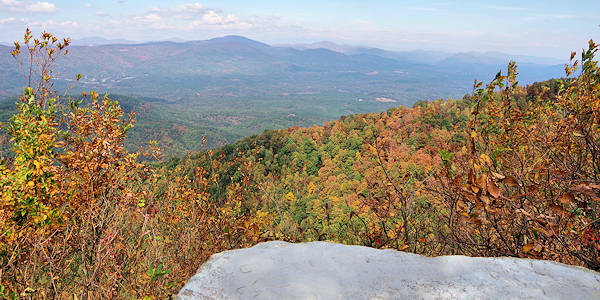 From downtown, drive five miles up the twisting road to the top and gain about 2,000 in elevation. Stop at Shunkawauken Falls, a roadside 150-foot tall waterfall. Then end your journey with panoramic views from Sunset Rock. Read more. Columbus is the county seat for Polk County. 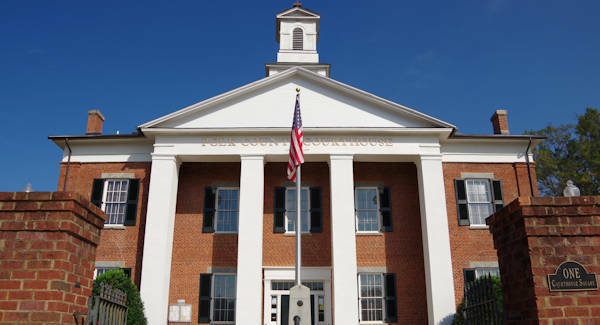 The historic 1857 courthouse is one of the oldest still in use in North Carolina and has been restored. Take a look inside! 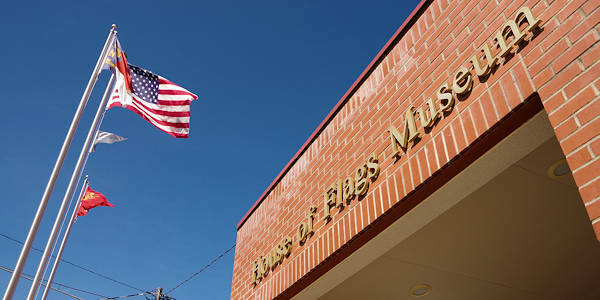 Tour the only flag museum in the country! The House of Flags (33 Gibson Street) has 300+ different flags, including military, international and religious flags. The Polk County Historical Museum (60 Walker Street) tells the local history with fascinating photos and artifacts. Both museums are open Tuesdays and Thursdays 10 AM-1 PM and Saturdays 10 AM-4 PM. 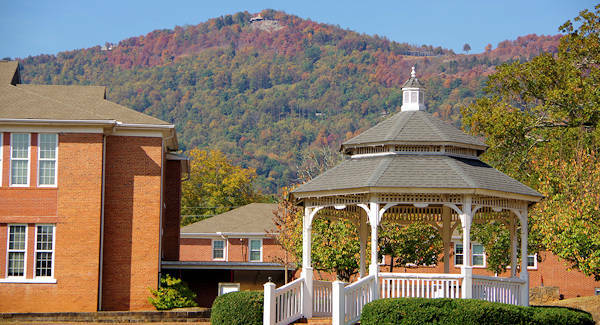 Columbus is located in the middle of so much to see, located about 18 miles from all of these fun small towns: Chimney Rock, Lake Lure, Hendersonville, Flat Rock and Rutherfordton.